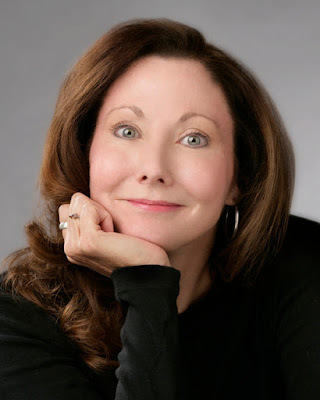 KidLit411 welcomes the amazing and talented Sherri Duskey Rinker to the Author Spotlight this week! 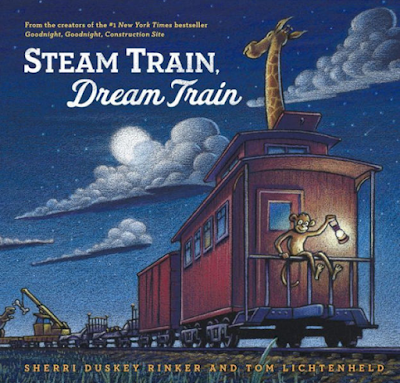 Sherri is the author of the New York Times Bestselling book, GOODNIGHT GOODNIGHT CONSTRUCTION SITE and STEAM TRAIN DREAM TRAIN. Please welcome Sherri! As a child, I'd grown up loving picture books (thanks to an indulgent grandmother). Later, when I became a mom, my love of picture books was rekindled when I was able to introduce my own boys to the books I had loved, along with being able to experience so many new, beautiful titles with them. I was pretty obsessed with children's books at that time: I bought EVERYTHING. Probably due in large part to the beautiful combinations of words-and-pictures in books with which I'd grown up, I teetered back-and-forth between loving writing and loving art. The very first thing I can remember wanting to be was an artist. Then, for most of grade school, I wanted to be a poet. I started college as a journalism major, but missed art so much that I moved to visual communications, which felt like the perfect fit: creating beautiful, compelling compositions with visuals and text. I was a graphic designer for about 25 years — designing logos, brochures, etc. Around 2007, I really began to grow weary of my career. The pace, the endless revisions, the "sell outs" of stock photography and stock art that I was expected to use felt like cheap hacks. I had been originally enamored by a career that nurtured and demanded beauty, innovation and quality. Then, it felt like speed and low price were the only objectives. During a pretty desperate financial time for our family, I felt disgruntled, overworked and "stuck" in a career that I often hated. So, I did the only thing I could think to do: I prayed — often. One night, just as I was falling asleep, I got the idea for GGCS: the overall idea, the title, the refrain --- all of it. And, really, that's how the journey began. 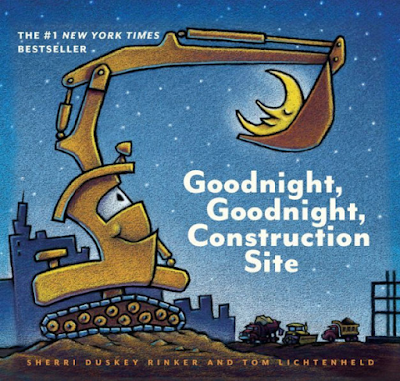 GOODNIGHT GOODNIGHT CONSTRUCTION SITE (your debut!) has been on the NY Times Bestseller list for years. What do you attribute to its success? 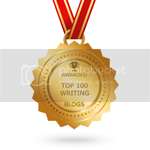 Did you ever expect to get pulled out of the “slush pile?" I guess the great thing about my submission to the infamous "slush pile" at that time was that I honestly didn't know any better. I made a long (VERY long) list of publishers who accepted slush and just started working down the line. I made notes of how long it would be before I could assume the answer was "no" from each publisher, so I ultimately had a list and a timeline that would allow me to submit exclusively to publishers, one-by-one, for about three years. I had done enough research and had heard enough stories to know that it might take a very long time for someone to take an interest in the manuscript, but I had also heard that being persistent was important. I definitely DID NOT expect that I would be published by the very first — and ultimately only — publisher to whom the manuscript was sent. That was a total surprise — and a gift, certainly. I'm not completely sure what has made the book so successful. For sure, Tom's beautiful illustrations have helped! And, I guess the idea is ultimately universal and simple: kids adore big trucks, kids need to go to sleep. But I also hope that, somewhere, the book speaks to love: it was written out of love for my own children — and, really, all children. This coming spring, I have a book coming out with Balzer + Bray, illustrated by the legendary Patrick McDonnell – called SILLY, WONDERFUL YOU. It’s available for preorder HERE. NEXT spring (2017), a long-awaited sequel to GGCS will debut, (illustrated by Tom Lichtenheld, of course!) and numerous new board books (which Tom will also illustrate) will follow. In addition, I have a 2-book project with Scholastic, to be illustrated by Matthew Myers, about a very little dog named Tiny. The first book should be out in 2017 or early 2018. And, in 2018, IT'S SOO QUIET, a book that I’ve written as a tribute to my memories of West Virginia (my dad’s home state) will release, illustrated by Tony Fucile. (Chronicle). There are some other projects, waiting to be finalized or waiting for illustrators… but that’s the “for sure” stuff for now. Take the chance. You never know. (I'm sort of the poster child for that, right?) The worst thing that can happen is nothing — but that's EXACTLY what will happen if you let that manuscript sit in a drawer. One of my favorite movies ever is a comedy called Defending Your Life. The whole theme of that movie is that the point of living is to overcome fear. Living in fear is not living; there's no growth in playing it safe. I like that message; I try to remember it and live it. In 2008, after nearly 25 years as a graphic designer, Sherri Duskey Rinker was seeking creative fulfillment. Inspired by her young sons, she wrote GOODNIGHT, GOODNIGHT CONSTRUCTION SITE and submitted the manuscript to a single publisher, Chronicle Books, via the slush pile. Seven years later, Sherri is the author of two #1 bestselling picture books, GOODNIGHT, GOODNIGHT, CONSTRUCTION SITE and STEAM TRAIN, DREAM TRAIN. Cumulatively, these two books have spent nearly five years on the NYT Bestseller List. 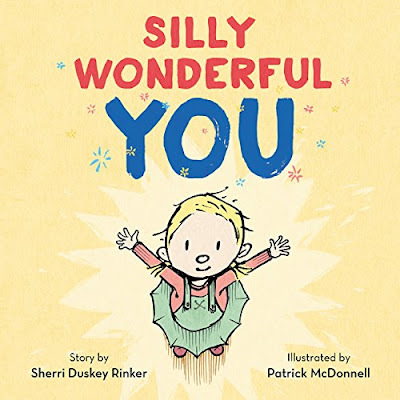 Additionally, Sherri has numerous other projects in production, including SILLY, WONDERFUL YOU, illustrated by Patrick McDonnell (Balzer+Bray/HarperCollins, Spring 2016), a sequel to GOODNIGHT, GOODNIGHT, CONSTRUCTION SITE, illustrated by Tom Lichtenheld (Chronicle Books, 2017), a picture book homage to Virginia Lee Burton, illustrated by John Rocco (Houghton Mifflin Harcourt, Fall 2017) and a two-book early reader set, titled TINY AND THE BIG BONE, illustrated by Matthew Myers (Scholastic, Fall 2017). Sherri is passionate about children’s literacy and has had a life-long love of books. Her exciting school presentation, "Books Are Magic!” is helped along by her graphic design background and is designed to encourage and support students on the wondrous journey of reading and writing. 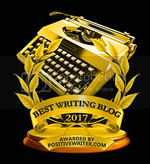 Sherri resides in Saint Charles, Illinois and works full-time writing books for kids and presenting around the country to both children and adults. Awesome interview! Thanks for sharing how these books became to be. And congratulations on all the new books yet to come. My mom bought my daughter Goodnight Goodnight and she loves it! Thanks for letting us "in" on your story....inspiring! So very inspiring - thanks for the interview! Sherri, I appreciate learning more about your life and writing. Are you continuing to work without an agent? Sherri, I have your books in my personal library :) Thank you for the inspiration and I look forward to the new arrivals. Holy moly...that is a rocket launch of a success story (with much work and years of passion behind it)! Congrats to Sherri and her amazing rise to fame! I normally wish people much luck in their future writing careers but in this case, it'd be like wishing J.K. Rowling luck. LOL! Wow! Love to hear a success story. Keep those books coming! Thanks for the giveaway! Wonderful books! Thanks for this post. My son loves these books. Very inspiring interview! Thanks so much. I love hearing how she made it out of the slush pile! Thank you.